Planning a vacation to America’s Midwest can be a lot like planning any other vacation: what should we do? How will you keep everyone entertained? It also presents some challenges you may not find for other destinations, namely: what will the weather be like? Fortunately, there’s a solution for all of this. Spectacular waterpark resorts are located all across the Midwest, and many of them offer far, far more than just a swimming pool and a waterslide. You’ll be surprised. You’ll be thrilled. You’ll be motivated! Here are our Top 10 Midwest Waterpark Resorts! We know what you’re thinking – a ranch means horseback riding, and you generally don’t find horses anywhere near a waterpark. At Double JJ Ranch, that’s part of the magic on your Rothford, Michigan family vacation. If you want to get technical, the Double JJ has horseback riding, a 60,000-sq.-ft. indoor waterpark and an 18-hole championship golf course. But clearly, the waterpark is a main attraction with its crazy/lazy river, water basketball, water fort and the tallest indoor waterslide in western Michigan. That’s especially true in the winter, when it’s tough to golf but still just as much of a thrill to get wet. Meanwhile, the onsite ranch offers horseback riding year round, with trail rides for all ages and levels of experience. And the accommodations are just as varied as the activities, including the Lofts Hotel with Deluxe, Jacuzzi and Studio rooms and suites, family cabins and log homes, plus condominium lodging. What more could you ask for? Experience a real-life cattle drive at the Double JJ as you move the cattle from pen to pasture! These two-hour adventures are available spring, summer and fall. From Chicago, take I-94 East to Benton Harbor, MI. Travel N north on US-31 to Mile Marker 136, and take the Winston Rd./Rothbury Exit. Turn right onto Winston Road. Approximately 1/2 mile later, turn left onto Water Road. You have now entered Double JJ Country! The Thoroughbred Golf Club at the Double JJ Ranch features an Arthur Hills designed 18-hole championship course with bent grass tees, fairways and greens – the only golf course in Michigan where horses have the right away on cart paths! For quite some time now, Chula Vista Resort has been inviting you to “Vacation Better” in Wisconsin Dells. And we can certainly see why. Many people recognize the destination as the waterpark capital of the world, and Chula Vista is certainly a big reason why. Start with Lost Rios – the 80,000-sq.-ft. indoor waterpark. This alone, with features like the Flyan Mayan roller coaster, Mount Montezuma’s Mayan Temple and the Rio Rapido Action River, is a Wisconsin Dells vacation. But there’s also the breathtaking 120,000-sq.-ft. Adventure Lagoon outdoor waterpark here, which features an incredible assortment of thrills and relaxation. The Wavepool is one; the Sport Pool and the Kiddie River area ensure that everyone of every age can have a blast at Chula Vista. A major difference between Chula Vista and any other Dells waterpark is its location. Instead of in town, where the parks are often across the street from one another, Chula Vista is located a discrete distance to the east, along the Wisconsin River and surrounded by nature instead of bustle. Vacation better, indeed. Jungle Adventure, within the Lost Rios indoor waterpark, lets you swirl and twirl inside a giant bowl ride to your choice of three light and music shows! Superstition Springs Miniature Golf Course is a lot like real golf: it’s a challenging course among ponds, rivers and even waterfalls. Tons of fun! Africa is calling you. And if you choose to answer, you’ll be surprised to learn that it’s actually in Wisconsin Dells, Wisconsin. That would be the Zambezi outdoor waterpark at Kalahari Resort, one of the crowning glories in the waterpark capital of the world. It’s not just the themed twist you’ll find here, with attractions including the Splashdown Safari interactive play area and imaginative waterslides like Swahili Swirl, Zimbabwe Zipper and the Wild Wildebeest. The African fun continues at Kalahari’s indoor theme park – featuring an African-themed carousel and a six-story glass-enclosed Ferris wheel. Together with mini-golf, a sprawling arcade and a 24-lane bowling alley, this is the kind of environment that has put Kalahari on the tip of many people’s tongues for waterpark vacations. The theme even continues into the spacious rooms and suites. You’ll never doubt where you are in a Nomad or Desert Room, not to mention the African Queen or Safari Suites. Actually, you may not doubt that you’re in Africa. But the whole time you’ll be in Wisconsin Dells on an unforgettable waterpark vacation! You can also find a Kalahari Resort in Sandusky, OH. An additional location is scheduled to open in Fredericksburg, VA.
Kalahari staff travels annually to African markets and hand selects the authentic art and artifacts on display at Kalahari Resort. Kalahari Resort in Wisconsin Dells offers 100,000 sq. ft. of flexible event space including an elite executive boardroom and multiple ballrooms. Great Wolf Lodge is our No. 1 choice for Midwest waterparks for a variety of reasons, but one of them is certainly its admirable coverage of the Midwest. Of its 12 waterpark resorts, three are in the central U.S. including the Wisconsin Dells, Traverse City, MI and Sheboygan, WI. Another good reason is that Great Wolf Lodge has defined and redefined the concept of a family waterpark vacation. 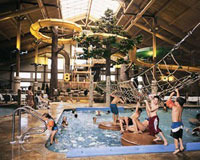 Along with its immense indoor waterparks – the Traverse City location alone has a 51,000-sq.-ft. entertainment center with six swimming and activity pools, eight waterslides, a 100-game arcade and more – each Great Wolf Lodge offers full-service spas for adults and tweens, a variety of onsite restaurants and whimsically themed suites. It’s a total vacation, without ever leaving the resort. If you’re looking for Great Wolf Lodge in Sheboygan, you’ll find it under the name of Blue Harbor Resort. While the other Great Wolf locales feature a grand yet charming Northwoods theme, the Blue Harbor experience is slightly upscale and definitively nautical – a fitting casual elegance on the shores of Lake Michigan. Great Wolf Lodge Wisconsin Dells now features MagiQuest, a four-story, live-action adventure game with an enchanted kingdom, puzzles, hidden treasures, dragons and more. It’s a combination of video gaming, role-playing and story-telling! Great Wolf Lodge is known as "America’s Largest Family of Indoor Waterpark Resorts." The Wolf Den Suite is just one of the themed family suites you’ll find at Great Wolf Lodge, featuring an in-suite cave-themed area with a bunk bed, movies, Nintendo and a TV just for the kids! If you live in the Midwest and you’re craving a Florida Keys-style getaway, here are the directions. From Chicago, take Interstate 94 northwest for 42 miles. You’re there! Well, you’re not actually in the Keys. But at Key Lime Cove, you might as well be. This is a tropical island-themed getaway under one roof, and the roof happens to be in Gurnee, IL. The waterpark is known as Lost Paradise, but it’s hard to believe it’s all that lost considering its proximity to Chicago, Milwaukee and Rockford. The only time you won’t feel positively Floridian is when you’re spinning through the Hurricane Vortex or flying down the gigantic Wahoo and Screaming Banshee tube slides. Which means plenty of tropical fun in the wave pool, on the lazy river or somewhere within Toukie’s Big Deluge play structure. Being a boring adult is great, too. Shopping and live entertainment abound at Key Lime Cove, and the full-service Paradise Mist Spa has a full menu of services for women, men, groups and even teens and tweens. That doesn’t include the face painting, stilt walkers, fortune tellers…the list goes on and on. Splash Down and Slip-Slidin’ Away are two giant body slides, each more than 500 feet long – no tubes or rafts required! KeyLime Cove is a kid-friendly hotel featuring 414 resort-style guest suites and staterooms in nine different configurations. Boyne, MI is known for many things – chief among them downhill skiing, snowmobiling and golf. That balance is about to change, given the presence of Avalanche Bay. At a whopping 88,000 sq. ft., it’s the biggest indoor waterpark in Michigan. What do you put inside a structure so large? In this case, it’s a Swiss-Austrian village. In the winter. With lots of snow. The only disruption to this atmosphere is the fact that it’s always 84 degrees at Avalanche Bay, perfect for year-round Michigan family fun. And if you’re wondering why it’s called Avalanche Bay, you’ll soon find out as you climb the Splasherhorn, hear the horn blow and get doused by 800 gallons of water cascading down the mountainside. There’s also the Vertigo tube slide – the name speaks for itself – along with a vertical climbing wall, floating icebergs, a Super G slide and Rip Zone, and a surf simulator. Surfing in Switzerland? You bet! There’s also a wide range of more relaxing pursuits, wet and dry, and after a full day, your lodging awaits in the Mountain Grand Lodge and Spa connected to the waterpark. Could you ask for more? The Haute Route Water Crossing lets you test your balance as you grab a rope net from above and step across floating icebergs – hopefully without falling into the pool! The Avalanche Bay Arcade has more than 100 of the most modern arcade games. The Zehnder family has been operating hotels and inns here since 1927, and every bit of their Bavarian history shows through- even at the modern waterpark at today’s Zehnder’s Splash Village. It must have been kind of strange for people in 2004 to see part of the 137-room Bavarian Haus being demolished, but they were amazed afterwards. Zehnder’s Splash Village is now a 152-room hotel with a 30,000-sq.-ft. waterpark. We’ll leave it up to the wildest imaginations to figure out how they got the 400-gallon dumping bucket in there, or who designed the four-story tube slides and named them the “Perilous Plunge.” But even in minds like this, there was obviously room for more. There’s also an arcade, and refreshments at Elf Hollow Café. For good measure, check out the tree in the hotel lobby – complete with a gas fireplace built into the trunk. Actually, elves and such seem to be a recurring theme at Zehnder’s Splash Village. All part of the fun! The Fortress at Zehnder’s is a Scottish-style 18-hole par 72 golf course that’s both challenging and breathtakingly beautiful. Zehnder's is the second-largest independent restaurant in the U.S., and America's largest family restaurant. Zehnder's Splash Village offers 146 deluxe accommodations, including family suites with fireplaces, sitting areas and flat screen TVs. Splash down at Castle Rock Resort and Waterpark, conveniently located in Branson, Missouri! The indoor waterpark at Castle Rock Resort and Waterpark offers you the perfect vacation whenever you visit. Always 84 degrees, rain or shine, this weather-proof vacation destination offers fun for the whole family. They offer two different three story thrill water slides, two 500 gallon dump buckets, Multiple Indoor and Outdoor activity pools, lazy river and more! When you need a break from all that waterpark fun, stop by the on-site Tower Grill for breakfast, lunch, or dinner with classically American options like catfish nuggets and foot long corn dogs. And, at the end of the day, your room is waiting with cozy beds and plenty of comfort. Castle Rock offers you two different three story thrill water slides. Castle Rock's location in Branson, Missouri, offers you the perfect opportunity to see live shows like New Shanghai Circus's Acrobats of China. Timber Ridge Lodge & Waterpark is fairly unique- where else can you climb, swim, slide, and occasionally run into a moose all in the same afternoon? 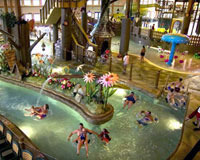 Moose Mountain Falls is Timber Ridge Lodge's 50,000 square-foot indoor/outdoor water park, known far and wide for its stupendous fun and enormous size. There's just so many ways to entertain yourself here! The 35-foot-high slides take you on an epic 300-foot adventure of twists and turns, eventually dumping you into a heated pool. It's ideal for thrill seekers, but for a tamer ride, The Lazy River drifts more than 500 feet of calm, relaxing tranquility. Bring the family, by the way; a stay at Timber Ridge Lodge comes with four free water park passes with a one-bedroom suite, and six passes with a two-bedroom suite. So go ahead. Get soaked. The more you bring, the more fun you'll have! 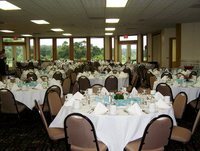 The lodge is 0.9 miles from the Grand Geneva Golf Courses and 1.9 miles from the ski slopes of The Mountain Top Resort. Reservations include complimentary passes to the indoor/outdoor water park, which has a food court. Grizzly Jack's Grand Bear Resort's waterpark is the stuff that wet 'n' wild dreams are made of! Fun can be had year-round at Grizzly Jack's Grand Bear Resort's indoor water park, Grand Bear Falls. This 24,000 square foot indoor waterpark is the full package: it has nearly everything you could ever want in a waterpark. Whether you're having a blast in the play zones, slides, and wave pool or relaxing on the lazy river or in the tranquil spa, the hours will absolutely fly by. There's also onsite minigolf, an arcade, and so much more! When you're not having fun, you'll be hanging out in your spectacularly cozy room or out experiencing everything the formidable charms of Utica. The resort is 2 miles from Starved Rock State Park, and 4 miles from Vermilion River Rafting and Fishing. Dining options include a sports bar serving American cuisine, and a casual cafe.